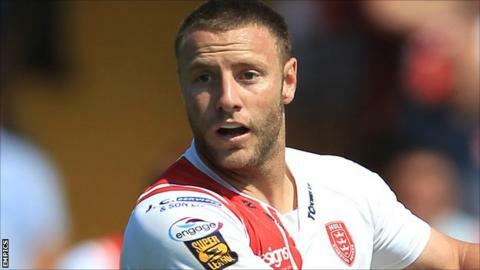 Blake Green will join Wigan Warriors from Hull KR for the start of 2013. Wigan say they have agreed "a substantial settlement fee" for the 25-year-old, who still had two years remaining on his contract with Rovers. The Australian-born half-back had spent two years at Craven Park, having joined the club from Canterbury Bulldogs. Wigan's regular half-back pairing, Brett Finch and Thomas Leuluai, are both set to depart the DW Stadium at the conclusion of the play-offs. Wigan coach Shaun Wane said: "I am really excited to have Blake joining us. "We have admired his style of play for some time at Wigan with his ability to attack the line, his kicking game and his strong defence. "He will be a great addition to our squad and has all the qualities we need both as a player and a person." Green added: "I'm really excited to be given the opportunity to play for Wigan Warriors. "They are a great club with a proud history which I'm sure will only improve my game. "I'd like to thank [chairman] Neil Hudgell and Hull KR for the way they have treated me over the last two years and will leave them with only good memories and close friendships."